Although Intel’s Atom CPUs have made a splash in the mini ITX space, many users prefer the small form factor yet want more computing power than the Atom can muster. In response to this need, motherboard manufacturers have started to build standard socket motherboards in small form factors such as mITX. Over the past decade, features such as video, audio, and network interfaces have moved from occupying expansion slots to being integrated directly on the motherboards. For many users onboard video, audio, and LAN obviate the need for add-on cards in a system. With all of this basic functionality onboard, smaller motherboards have become possible, such as mini ITX. With the highly integrated nature of the Intel BOXDH57JG, the test configuration was relatively modest, but mirrored my traditional H55 and Atom setups. Overall, this was an extremely easy system to build. I would suggest that using 1-3w more and the Apex case’s included power supply, saving $70 from removing the PicoPSU from the build would be a smart choice. The picture above shows just how small the motherboard is, and how the board is jam packed with components. For the picture above, I was using the Apex case’s included PSU. Mini ITX boards come in two flavors. First are the bare minimum boards where the focus is building a cheap, small, and low power system. Second, there are boards that try to deliver maximum functionality in a tightly spaced package. On this spectrum, the H57 chipset shows that this board is geared toward the second case of providing a small form factor with lots of functionality. 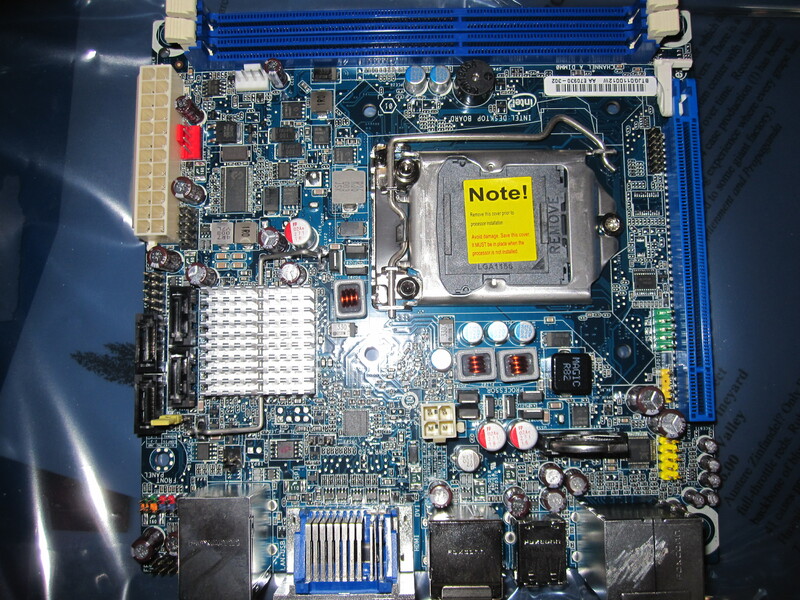 The Intel BOXDH57JG provides plenty of expandability once one recognizes that this is a mini ITX board not a full sized ATX board or mATX board. On board real estate is limited. The Intel BOXDH57JG supports up to 8GB of RAM in its two DDR3 slots. With 4GB memory modules becoming less expensive, using two 4GB modules becomes a less onerous proposition. Realistically, for a HTPC, there is little need for more than 4GB of memory that will be the streaming target of video stored on remote servers. SATA II (3.0gbps) is supported with four internal and one eSATA port. This is a major step up from an Atom NM10 platform that is limited to two native SATA channels. The H57 is able to support six SATA channels so it would have been nice for Intel to have supported another internal SATA channel. With that being said, there are plenty of onboard channels for a HTPC (where one needs two to three channels), and enough SATA channels for a low-end storage server. Realistically, users opting to build a home server based on a mITX board will likely be using a small enclosure, and therefore will not need many more SATA ports. Furthermore, one could add a PCIe HBA or RAID card to add additional SATA ports for storage. Along those lines, the Intel BOXDH57JG provides a single PCIe 2.0 x16 slot for either a dedicated GPU, additional NICs, a TV tuner, or a HBA/ RAID card. This single slot expansion limitation is a product of the mITX form factor. Luckily, with a solid number of SATA ports, an onboard Intel NIC, decent onboard audio, and onboard (with Clarkdale CPUs) video that is easily capable of deciding h.264 video, the PCIe x16 slot has a lot of usage flexibility both for HTPC applications and home server applications. Onboard Gigabit Ethernet duties are handled by a Intel 82578DC Gigabit NIC. As regular readers will note, I am a believer in the fact that Intel makes the best, most supported NICs in the industry, making them essential for any media streaming build. With the Intel BOXDH57JG being ideal for either a small home server or a HTPC, having an onboard Intel NIC saves $30-40 purchasing one seperately. One drawback of the 82578DC is that it has no cache like some of the more popular 82574L Intel chipset. Overall, this is a major selling point for the Intel BOXDH57JG over other mini-ITX boards from manufacturers using lower cost Realtek 8111 based NICs. The Intel BOXDH57JG uses the Realtek ALC889 codec and has Integrated Intel High Definition Audio with Dolby Home Theater. Audio output can be channeled through the analog out ports, the SPDIF optical output, or the HDMI. From the official spec sheet, the BOXDH57JG has a 10-channel (7.1+ 2 independent multi-streaming) audio subsystem. Sadly, my home theater system is limited to a 7.1 system and therefore I was unable to test a 10 channel setup. My general sense though is that if a user has a 10 speaker setup, their PCIe slot will, at minimum, be filled with a custom audio card instead of relying upon onboard audio. 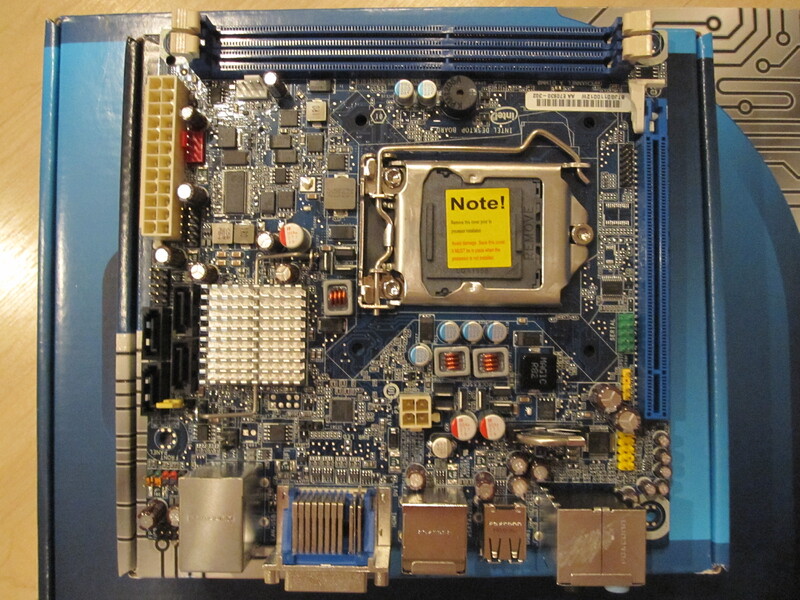 Generally smaller motherboards have lower power consumption. This is for several reasons including a physically smaller footprint with fewer components. 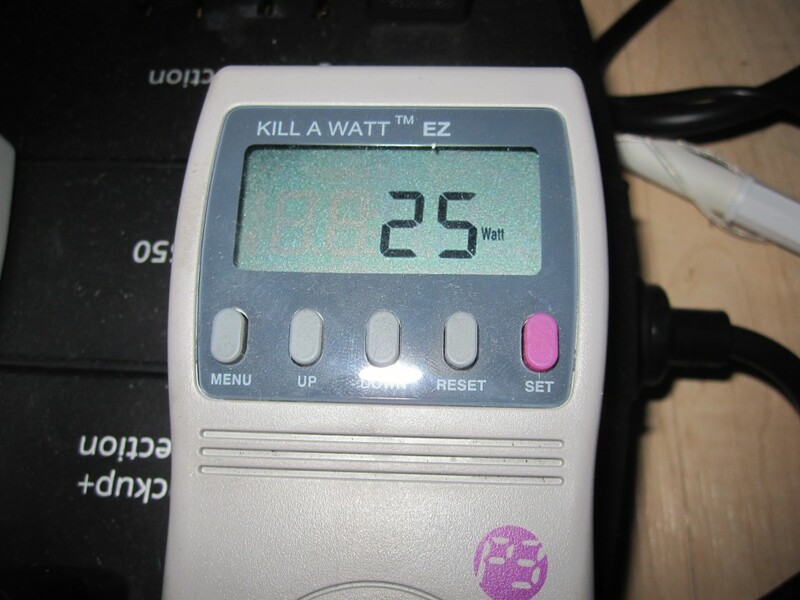 The Intel BOXDH57JG proved to have excellent power consumption features. Consuming 25w at idle with an Intel Core i3-530, the Intel BOXDH57JD matches the ZOTAC NM10-A-E idle power consumption with the Atom D510 (although the Atom’s max power consumption is significantly lower) and is lower than the previously reviewed Core i5-650 plus Gigabyte H55M-UD2H combination that came in at 27w at idle. Overall, this is a great result for anyone building either a HTPC or a home server where idle power consumption is key. Officially the Intel BOXDH57JG only supports LGA1156 32nm dual core CPUs. Clearly, with the H57 chipset, it is geared towards providing onboard video output. It was to my surprise when I was able to install and run a Xeon X3440 in the BOXDH57JG. My initial worry was that the board was unable to supply enough power for such an endeavor, however I was proved wrong. Of course, your results may vary as this is an unsupported configuration of the BOXDH57JG. 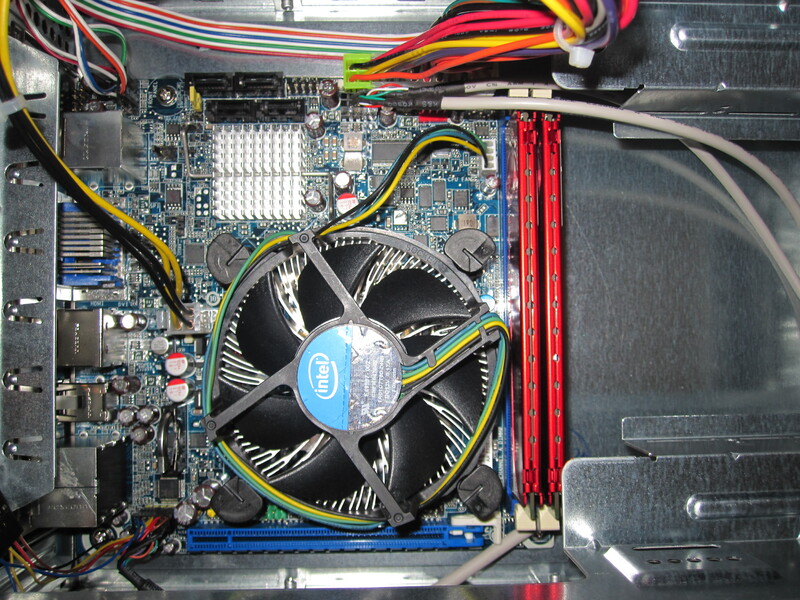 Overall the Intel BOXDH57JG is a great HTPC board. It is small, has an onboard Intel NIC, low power consumption, and is fast. Also, the H57 chipset provides RAID functionality missing from the H55 chipset. One gets the ability to play back and encode video at fairly high speeds thanks to the officially supported Clarkdale CPUs. The main drawback is price, realistically, if this board was $60-70 it would make Atom boards on the desktop nearly obsolete. At about $125, the Intel BOXDH57JG is still a great platform paired with a Pentium G9650, Core i3-530, or Core i5-650. great review. i’m not sure who has a 10 speaker audio setup. here, 5.1 is about the max. Another handy review with lots of useful info, many thanks. Any real advantage over getting the H57 over the H55 though, considering its just software RAID on the 10R controller? It seems that if youre building a home server and cost isnt the overriding factor, then the Q57 series with AMT is more attractive. Did you try using a non-video card in the PCIe slot? I’ve dealt with a number of motherboards that have only one PCIe x16 slot, and that slot is exclusively for video. Using any other card will, at best, boot but get no functionality from the card, or, worst, not boot at all. One example: the Gigabyte ga-ma74gm-s2 (I even confirmed this limitation with Gigabyte). I tried using a 2-port PCIe x1 SATA controller in the x16 slot. The motherboard booted, and I could even read from drives attached to that 2-port add-on card. However, whenever I tried to write to one of those disks, the system would immediately reboot. I’ve had an Intel DQ45CB motherboard and I used an HP dual port gigabit NIC (which is PCIe x2, I think) in the PCIe x16 slot. It worked. I configured teaming these two NICs on a Win2k8 SP2 with HP NIC teaming utility. I’ve sold the DQ45CB now and I’ll buy DQ57TM soon. Sorry I was 6000 miles away from home on business last week. ra1d – Adding a RAID card is expensive for a high-end card, but not that much more for a lower-end card. Figure two SATA 8 port HBAs cost $200-$220 while an Adaptec 31605 may cost $325 without BBU. It is more, but you get a lot more (i.e. RAID 6) with the dedicated card, and it fits in one slot rather than two. Adrian – I would suggest that there is not much. The H57 has two more PCIe x1 lanes and two more USB ports (in addition to the aforementioned RAID functionality). In the mITX form factor, that is less of a benefit. Matt – I tried an Intel quad port NIC and a Adaptec 3085 and they both worked. Another great product, I see great performance here and RECOMMENDED PRODUCT ! !